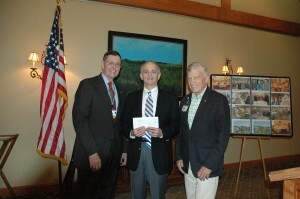 Caption: from left to right, Auxiliary President Michael Clemmer, Jeffrey M. Fried, FACHE, President and CEO of Beebe Medical Center, and Judge William Swain Lee, Chairman of the Beebe Board, stand for the camera following the presentation of the Auxiliary’s $306,000 donation presented to Mr. Fried by Mr. Clemmer. The Beebe Medical Center Auxiliary presented Beebe Medical Center with a check in the amount of $306,000. The check represents the single largest annual gift the Auxiliary has given to Beebe and will be used to fund the renovations taking place on the fourth floor of the hospital. Auxiliary President Michael Clemmer, speaking at the Auxiliary’s annual luncheon, said that the gift could only be made possible through the dedicated efforts of the Auxiliary members. Beebe Auxiliary held its first recorded meeting in 1936 in the Lewes home of Mrs. Edwin Marshall. Today, it has 250 members, 140 of whom actively donate more than 50 hours a year in raising resources in support of patient care programs at Beebe Medical Center. In recent years the Auxiliary has donated more than $3 million to Medical Center. “Over the past year, the Auxiliary members have clocked 31,500 hours of volunteer time, equivalent to 16 full-time employees,” Mr. Clemmer said, noting that funds have been raised through a variety of activities, including the hospital Gift Shop, employee sales, and events like the Fun Fest. An expanding craft group also has added to the funds as they make and sell their crafts, which often are found in the display cabinet outside the Gift Shop. A significant fundraising effort is the popular Beebe Treasure Chest Thrift Shop, located in the Midway Shopping Center. Two employees working with more than 50 volunteers keeps business booming. Mr. Clemmer formally presented the check to Beebe Medical Center President and CEO Jeffrey M. Fried, FACHE; Beebe Medical Center Board Chair Judge William Swain Lee was present at the ceremony.